There are many scenarios where a portable projector can be very useful – for business and for play. Providing a reasonably priced option, 3M Streaming Projector Powered by Roku (SPR1000) can tick both boxes, promising to make it easy to host an impromptu outdoor movie night or presentation using this highly portable, battery powered, 480p projector. Also, because it includes a Roku Streaming Stick in the box all of the over-the-top (OTT) goodness that service provides is available in a just-add-Wi-Fi experience. At $189 ($299 SRP) it almost seems too good to be true; let’s see where this little projector + streamer shine and where it is lacking. The 3M Streaming Projector Powered by Roku is surprisingly friendly towards international travelers, with a modular (US and UK plug adapters included) switching power supply provided. The cord is shorter than I would have liked however, with its 70” often too short for convenient placement in many locations–for example when the most suitable receptacle (outlet) is on the projecting wall. Obviously this is simple to fix by adding an extension cord to the travel kit, but a few more feet would have been greatly appreciated. The projector is a petite 4.25” x 4.25” x 2” and travels easily. Given the price it is not surprising that the picture is not that bright and the speaker poor, but in a quiet, light controlled room there is little to complain about. The 3M projector also offers a 3.5mm headphone jack so dealing with the more onerous of the two issues is easy enough–either with external speakers or headphones. Because the IR sensor is located on the top, using the remote can be a bit problematic when trying to control the projector via the sensible point-it-at-the-device method, but it works perfectly when using the ceiling as a reflection point so not much of a con once overcome. Most users will find it best to bring a small tripod along with the SPR1000, leveraging the included mount. This is strictly optional however since it works well enough on any flat surface, just makes it easier to square/level the picture for viewing. If used only for business-type presentations, fan noise might be an issue as, like most projectors, it can be a bit “buzzy” at times although not enough to be a concern during media consumption. The NR818 (and all Onkyo receivers) meet the MHL specification. The Roku stick requires a higher minimum power requirement than that called out in the MHL spec. This could be the cause of the phenomenon. The 2013 models were designed with Roku’s requirement in mind. The Roku Streaming Stick is certified to seamlessly work with Roku Ready devices so you need a Roku Ready device for review(http://www.roku.com/streamingstick). For the price, the 3M Streaming Projector Powered by Roku offers a reasonable amount of flexibility. The picture can be reversed or flipped, which combined with the screw mount enables most projection scenarios. There are options for contrast, brightness, and video levels. Unfortunately autofocus or color and keystone correction are not available, but again it is difficult to judge the device too harshly here because of how inexpensive it is. There are no excuses for the poor battery life however, which is only good for an hour forty-five at best–making it pretty much useless as a cordless movie player. 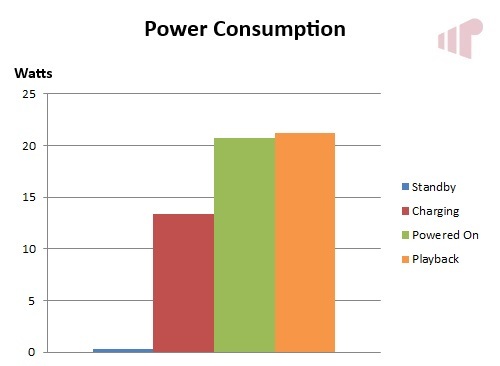 That is not to say that power consumption is bad, just that the battery is too small for extended use given the 21.7W the device requires when playing back video. Naturally the HDMI port on the 3M projector can be used with other HDMI equipped devices. Generally this worked exactly as expected, both with PCs and CE devices. The only exception noted was when using a DisplayPort to HDMI adapter the colors were wrong. Overall the 3M Streaming Projector Powered by Roku is a neat, although very niche, device. Its portability and included battery enable some interesting scenarios, but the poor battery life and sub-optimal audio performance limit the usefulness in a broader context. That said, with the right supporting infrastructure it does make an excellent travel companion as long as are you do not leave the grid behind. You call it a 720p projector; it’s not. It’s 854 x 480 native, it downscales anything above that. Thanks. The device exposes itself as a 720p device but only displays 480p. I’ve always found it odd when projector shopping how they typically play up the max input resolution and bury the native resolution away in a description line or in a spec sheat PDF. But I love how there are a bunch of $200 range projectors now with 20k+ hour bulbs in them. I remember having some projectors that would get 2k bulb life for around that price for just a replacement bulb. I’m considering this thing to watch on my bedroom ceiling. I’ll have to do a little research regarding mounting and projection angle and other adjustments but I’m assuming it would be doable. Yes, as long as you don’t need to correct the geometry of the projected image it will work fine for that. Um, I do. I missed the part where you mentioned there is no keystroke correction. The price did seem too good to be true. Speaking of the price, this has popped up on Groupon twice already for $169. Its ok for the price of course, but if i’m going to buy something like this it better have all the bells and whistles as the others. LOL. I saw some comparison videos like the one comparing it to the AAXA P2 Jr. and another comparing it with the Brookstone Projector so its pretty comparable with the others if Roku just isn’t your thing. I was able to get this projector last year off Cowboom’s deal of the day for $220. 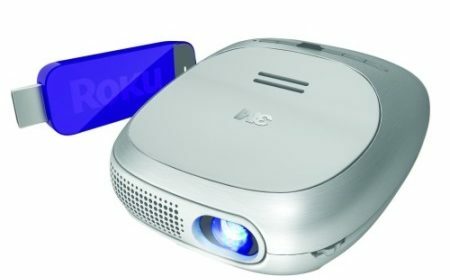 http://www.amazon.com/Casio-Lumens-Green-Projector-XJ-A240/dp/B003FP8A5E And I’ve seen some pretty good projector deals on Woot too. The the Roku seems like a nice little model for a kid’s party just to plug and play, but for not much more there are some pretty solid projectors that do a lot more. The main reason I got this (besides it showing up as a Gold Box) is that it is (or was supposed to be) an all-in-one portable media solution. It’s not the best projector, but considering that it comes w/ a ROKU & battery. Add some tethering, and it’s good to go pretty much anywhere dark + wall. For a permanent installation, it’s not the right choice, but that’s not really the target it’s trying to hit.